“1. Put on an indoor picnic! 2. Write love notes, stick ’em in a jar and give the whole thing to your sweetheart! 3. Enter a Valentine’s Day contest! 4. If you have kids, have a family dinner, and then put the kids to bed and share dessert for two later. 5. Celebrate with a full day planned out – walks in the park, rock climbing, picnics – anything that your significant other wants to do, but for whatever reason doesn’t. 6. Take a one-time dance lesson. 7. Make the day all about your significant other: meals of his dreams, rent movies that are their favorite, his music, etc. Just keep surprising them! 8. Use nature: a sunset, a sunrise, or even an evening walk gazing at the moon. 9. Create a chronological collage using photos of your relationship. 11. Pick-up some specialty foods: cheese, french bread, wine, then enjoy it in front of the fire place. 12. Spa Day! Pick up bubble bath, body scrub, candles and make it into a gift basket. 13. Give back rubs and body massages. 14. Become a mixologist and create a couple’s drink! 15. Create a movie theater in your own home: popcorn, soda, and old time movies. 16. Go out for a coffee and a danish, Paris style. 17. Pick up some of your significant other’s chores for the day. Take a load off ’em! 18. Spend time together walking the streets, window shopping, then stop for a drink or two! 19. Pick out some pairs of lingerie…then let them pick what they want you to wear. 20. Make a ‘Best Reasons Why I Love You’ list. 21. A little unconventional, but head on over to Sam’s or Costco and load up on free samples. 22. Try a new, low-cost activity. 23. Leave notes and mints on their pillow. 24. So simple: cook dinner, lay the table, light candles – a little goes a long way. 25. Or kick it up a notch and make a “restaurant” with printed out menus! 26. Go out dancing or to a free jazz club. 27. Buy two champagne flutes for use on Valentine’s Day only to annually toast your love. Break them out once a year. 28. Play a sport together that you haven’t played in awhile…and make a bet. 29. Put a ‘racy’ picture on their cell phone. 30. 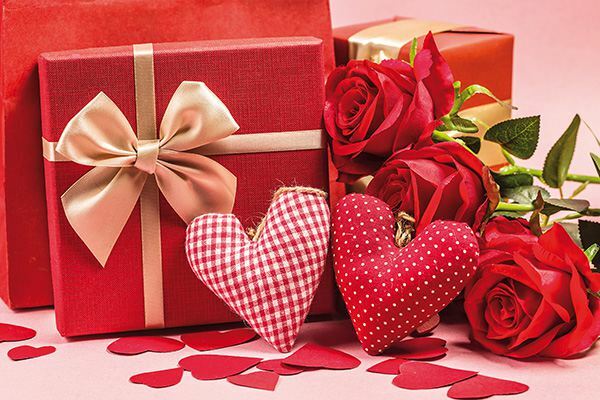 Valentine’s IOU coupons: I will make dinner; I will do the laundry; I will take care of the kids one day a month for the next year; I will clean the kitchen for a week; I will serve you breakfast in bed. 32. Early-bird dinner specials at nice restaurants! 33. Some volunteer fire departments use holiday fauna to create flower and rose bouquets as a fund-raiser. Prices are reasonable; just get there early. 34. Take her on a chocolate tour: every type, every kind. 35. Leave secret notes – use soap on the mirror, write in the steam in the shower, etc. 36. Write “I love you because….” notes and insert them into balloons. Blow up the balloons, and spread the balloons throughout your bedroom for your Valentine to pop and capture each message. 37. Take a good photo of the two of you and frame it. Simple, but meaningful. 38. Make homemade chocolate-covered strawberries: 1) Melt a package of chocolate chips in a double boiler and add a small amount of oil; 2) Remove from heat and quickly dip the strawberries into the chocolate; 3) Place on wax paper and refrigerate for several hours until chocolate is firm. 39. Flowers: order with your friends for “bulk” discounts, or pick “standalone” flower and make your own bouquet to save money. 40. A scavenger hunt: Write clues and place them in envelopes, and place the envelopes around town. 41. Get a small radio and take your partner dancing at a romantic hideaway, such as the woods or riverfront or ocean. 42. Use fabric paint to decorate a Valentine’s Day pillowcase for your loved one. 43. Repeat your first date. 44. Create a calendar with photos of the two of you. 45. Have a progressive dinner. If you’re single, appetizers at his place. Entrée at her place. The middle course, dessert, after-dinner cordials…map it out a few days ahead. If you’re married, one course at home, one course at her office, his office, etc. 46. Write new “updated” wedding vows. 47. In the morning, tuck a love note in his pocket or her pocketbook or other certain-to-be-found spot. 48. Have a 15-minute kissing session and try some new ways and places to kiss. The same old smoocheroo can get boring. 49. If you don’t have a special sweetheart, focus on bringing a smile or laughter to everyone you come in contact with on Valentine’s Day.